Have you ever wondered how to make caramelized onions? Caramelized onions are a great way to add rich flavor and flair to a dish. Adding them to pretty much any dish will take it to the next level and impress your guests. The process of caramelizing onions requires a little time and attention as you can’t rush the process. As the onions cook, their natural sugars will brown and develop a rich, sweet flavor. I usually make a large batch and store them in the fridge. You can add them to pizzas, flatbreads, burgers or pasta for a hit of flavor. Or use them to top steak, chicken or pork or fish. You can even add them to Greek yogurt for a delicious homemade dip. Start by heating some oil in a thick-bottomed sauté pan over medium heat. Add the onions and stir to coat them with the oil. After about 10 minutes, when the onions start to soften, stir in a small amount of salt (you can also add a small amount of sugar to help the caramelization process but this is optional). Continue to cook the onions, stirring occasionally (about every 5-10 minutes), until they are golden brown and caramelized. This will take an additional 35-45 minutes depending on how brown you want them. As they cook, scrape up the fond (the brown bits) on the bottom of the pan and mix it into the onions. If the onions start to burn or catch bottom, add a small amount of wine or water to the pan. The key is to let them stick a little to the pan and brown but not long enough so that they burn. Once the onions are done, add a small amount of wine or other liquid (like balsamic vinegar or water) and stir to release all of the brown bits from the bottom of the pan. 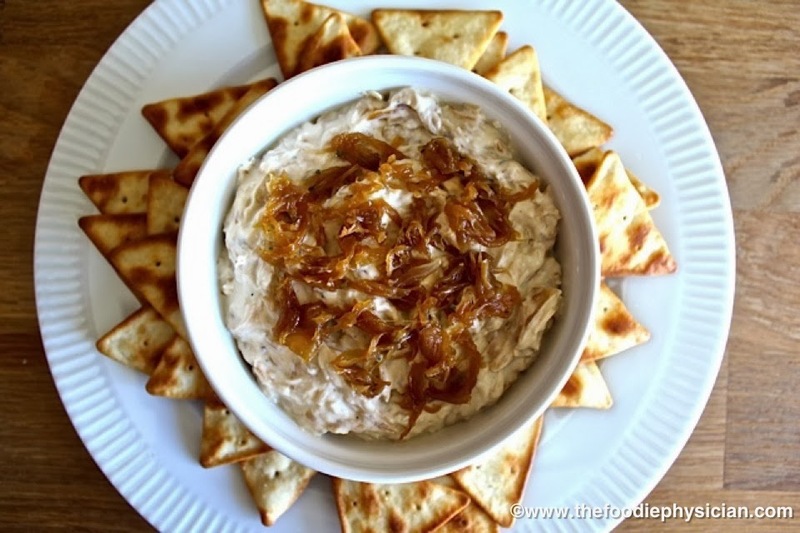 modern, healthy take on classic French onion dip, which uses powdered onion soup mixed with mayonnaise and sour cream. My dish blends sweet, caramelized onions with a mixture of nonfat Greek yogurt and a small amount of reduced fat sour cream. Fresh thyme, white wine, garlic powder and a dash of Worcestershire sauce add flavor without additional fat. Serve the dip chilled or at room temperature with fresh vegetables or crackers. 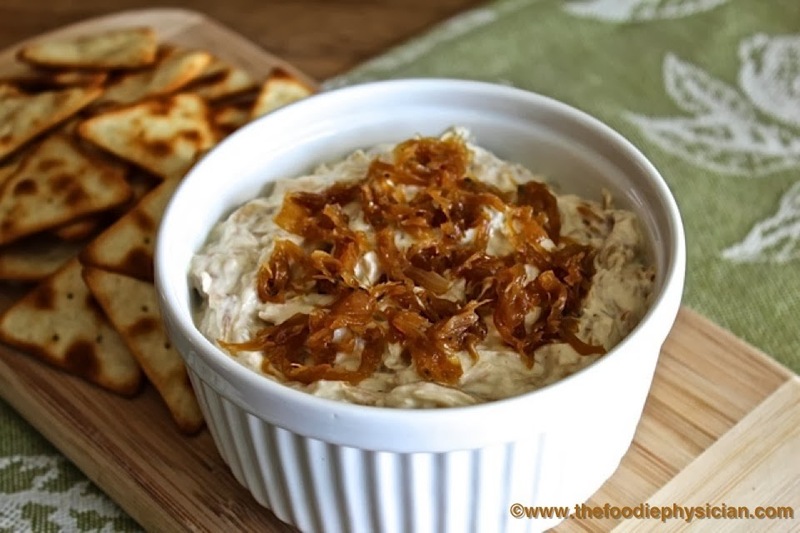 My Caramelized Onion Yogurt Dip is a modern, healthy take on classic French onion dip. Heat the oil in a large, thick-bottomed sauté pan over medium heat and add the onions. Stir to coat all of the onions with oil. Cook, stirring occasionally, about 10 minutes until the onions start to soften. Add ¼ teaspoon salt and thyme and stir to combine. If desired, you can also add a small amount of sugar (about ¼ teaspoon) to help the onions caramelize but this is optional. Continue to cook the onions, stirring occasionally, until they are golden brown and caramelized, another 35-45 minutes. As they cook, scrape up the fond (the brown bits) on the bottom of the pan and mix it into the onions. If the onions start to burn or catch bottom, add a small amount of wine or water to the pan. Once the onions are done, add the remaining wine to the pan and stir to release all of the brown bits from the bottom of the pan. Cool the onions, than transfer them to a cutting board and chop them. Mix the yogurt, sour cream, garlic powder, Worcestershire sauce, ½ teaspoon salt and pepper together in a bowl. Set aside a small amount of caramelized onions for garnish and stir the remaining onions into the yogurt mixture until distributed throughout. Garnish with reserved onions and serve. For maximum flavor, make the dip a few hours before serving.